WE DO NOT SHIP GLASS ENCLOSURES. You can purchase them in person from our retail store in Madison, WI. 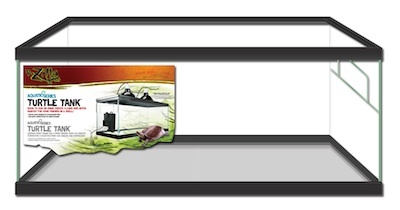 Filtering a semi-aquatic environment is easy with Turtle Tank , thanks to a patented filter mounting panel built into the side. Clean your turtle's water with a standard small aquarium power filter; the half-height end glass positions the filter at the right height for shallow water. A molded acrylic panel helps keep pets safely inside.